He was married to Susan Imogene Shero on October 10, 1965.
one step-grandson, Ben Alberding of North Richland Hills Texas. Golconda, Illinois Job Corp Center. in 1990, he began raising cattle. Harmony Society, singing in quartets as well as chorus. in the choir and teaching Sunday school. grandfather and will be missed by all who knew him. 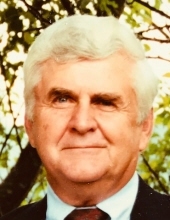 Funeral services for Allan will be held on Saturday, March 23, 2019 at 1:00 PM at the Watson Funeral Home in Eldorado with Rev. Chris Wise officiating. Burial will be in White County Memorial Gardens in Carmi. Visitation will be on Saturday at the funeral home from 11:00 AM until service time of 1:00 PM. To send flowers or a remembrance gift to the family of Allan Ray Ninness, please visit our Tribute Store. "Email Address" would like to share the life celebration of Allan Ray Ninness. Click on the "link" to go to share a favorite memory or leave a condolence message for the family.